According to the Buffalo News, the Buffalo Bills plan to manage the amount of reps TE Charles Clay takes in practice this season. Clay rarely practiced last season after dealing with knee injuries in 2016, though he still only missed one game. 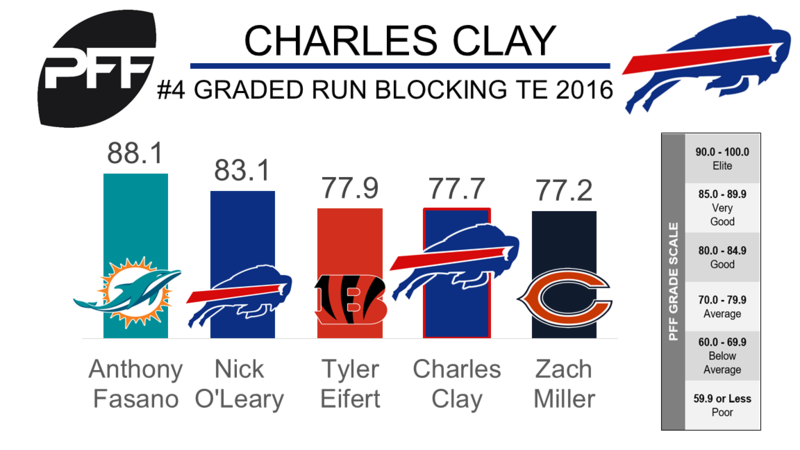 Clay played in 87.8 percent of the Bills offensive snaps last season, which was the highest amount of his career, and with Nick O’Leary the only other tight end on the Bills roster with any NFL experience, Clay may be in line for an even more prolific role next season if he stays healthy. While battling injury Clay’s receiving statistics took a dip — his drop rate of 10.94 was a career high and his 1.33 yards per pass route was a career low, and he was only able to average 3.4 yards after the catch per reception, which tied for 52nd out of 65 tight ends. Clay proved to be one of the better run-blocking tight ends in the league last season with a run-block grade of 77.7 that ranked fourth out of 63 qualifying tight ends last season.